The course for this competition marathon race starts and ends at the Oita Municipal Athletic Stadium, and the halfway point is set at the Beppu Kankoko International Port. It is a rather easy course to run as most of the course is on flat land. This course will thus be the first step to a successful career for new runners. At the Beppu Oita Everyday Marathon (then Beppu Marathon), Yasuo Ikenaka (deceased) from Nakatsu city, Oita Prefecture, who served as the Olympic representative coach in 1952 during the postwar reconstruction period said, "In order to open the way to the Olympics I would like to hold a nationwide competition locally in the city. "Initially it started ahead of Beppu station, it was a 35 km course that folded Shiraki Oita city.In the following 53 year twice tournament it is changed to a full marathon.It began to be called the Japan's three major classic races with the "Biwako Daily Marathon" (then marathon every day), which started in 46 years, and the "Fukuoka International Marathon" (then Asahi Marathon) that started in 1974. 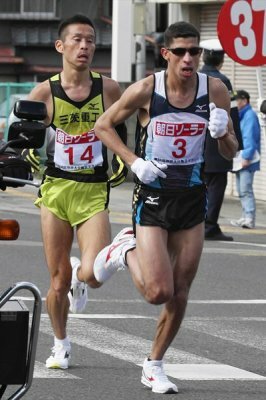 In the 12th tournament tournament, Toru Terazawa (Kurashiki Les) set the world record of 2 hours 15 minutes 15 seconds 8, which is 0 seconds 4 above the record of Abe (Ethiopia).This record is the last marathon world record recorded by Japanese athletes in the domestic race.After that, Terasawa accomplished four consecutive victories until the competition 15 times. Kenji Kimihara (Yawata Steel) won the domestic highest of 2 hours 13 minutes 33 seconds 4 in the 67th year 16th tournament, and Shoumo (Asahi Kasei) won 2 hours 9 minutes 5 seconds 6 at the 27th rally in 1982, It broke the first time "wall of 10 minutes". In the course to arrive and depart from the Oita municipal track and field stadium from 33 times in 1984.In 1994, at the convention, Hirokazu Morishita (Asahi Kasei) won 2 hours 8 minutes 53 seconds to significantly update the first marathon record, leading to the silver medal of the Barcelona Olympics in 1992. From the 50th memorial tournament in 2001 it was the race for the world championship selection.Started in front of Takasakiyama · Uimitago in Oita-shi from 59th convention for 10 years, and it changed significantly to the course which finishes to Oita municipal track and field stadium.From the next 60 tournaments, the marathon was relaxed within 3 hours and 30 minutes, and the girls also opened the door. In the 12th 62th tournament, Yuuki Kawanai (Saitama Prefectural Government Office) and Kentaro Nakamoto (Yaskawa Electric) deploy intense dead heat from 28 kilograms past 40 kilometers.Kawachi won the tournament record for the first time in 17 years, 2 hours 8 minutes 15 seconds, Nakamoto also entered second place at his best 2 hours 8 minutes 35 seconds, both of whom won the title of the world championship. In the 16th year 65th tournament, it changed to a course that makes it easy to get a good record by eliminating the blind alley in Oita city and reducing the height difference of the final stage.We also held a marathon national election visit to the Rio de Janeiro-Paralympic Games. 34 years old veteran, Kentaro Nakamoto (YASKAWA Electric Co., Ltd.) won the first victory with a favorable time of 2 hours, 9 minutes and 32 seconds in the 17th 66th tournament.Nakamoto is the first vertex of the marathon for the 14th time.He was also chosen as representative of the world championship London tournament. 67 times in 18 years, 68 times in 19 years is designated as the "MGC series" that can acquire the right to participate in the 2020 Tokyo Olympic Japan's national team selection race "Marathon Grand Champion Race" (MGC), Tokyo It is expected to be a hot battle with leading runners who aim for the Olympics. 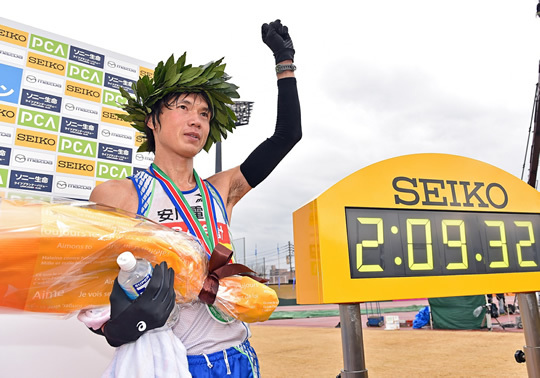 Until now, Hiromi Taniguchi, Hirokazu Morishita, Tomoya Adachi (Asahi Kasei in all) and others decorate the first victory of the marathon, are often referred to as "new entrance gate".